In support of the 34th America’s Cup, AMERICA and USA 76 are coming to San Francisco to allow residents and visitors the opportunity to experience the excitement of authentic America’s Cup yachts. Yes, Diva, that means you can jump (be careful!) ono one of these yatchs for a beautiful afternoon on the bay. Feel the wind in your hair, meet a few hot sailors, and enjoy the exhilaration of riding on a piece nautical history. Make sure to dress warm – this ain’t the Caribbean darling. Operated by ACsailingSF, the yachts will offer trips to individuals, groups or corporate parties beginning May 25, 2011 through September 2011. AMERICA is a replica of the 139-foot yacht that won the Royal Yacht Squadron’s “100 Guinea Cup” race around the Isle of Wight held in 1851. The replica was built in 1995 at a cost of more than $6 million. 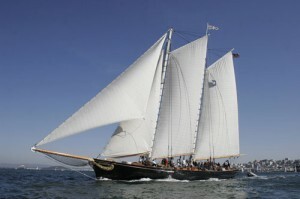 It now serves as a sailing vessel for entertainment and hospitality events, private charters and individual sails for up to 80 people, and will be operational in San Francisco through September 2011 before it returns to San Diego. USA 76 is an 85 foot International America’s Cup Class yacht previously owned and raced by the ORACLE Racing Team in their challenge for the 2003 America’s Cup held in Auckland, New Zealand.